So… walking down 6th St one SXSW night in Austin, I saw these 4 chaps wearing white overalls, and dog masks. 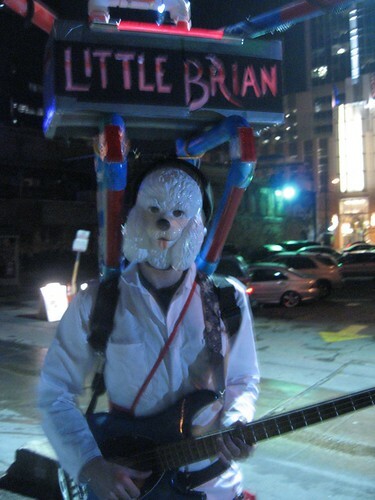 One in particular had a contraption called ‘Little Brian’ on his shoulders and a bass around his neck. They saw me trying to get a photo and come over to talk. “This is the portable funk machine!” one of the chaps says pointing to the one carrying all the apparatus. “Do you want to hear the funk? !” he demanded of me. I was, quite frankly, too scared to say no. So I was given a pair headphones and the fellow in the picture above played me some great funk bass while staring at me through the mask.